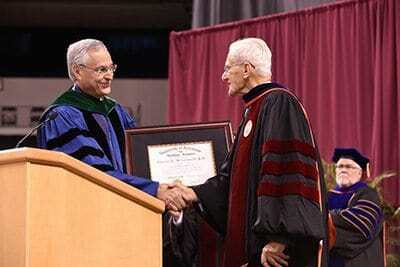 UAMS graduated 1,002 new health care professionals on Saturday during a ceremony at Verizon Arena. May. 23, 2016 | May 23, 2016 | LITTLE ROCK — The University of Arkansas for Medical Sciences (UAMS) awarded certificates and degrees today to 1,002 graduates of its five colleges and graduate school during its commencement ceremony at Verizon Arena in North Little Rock. 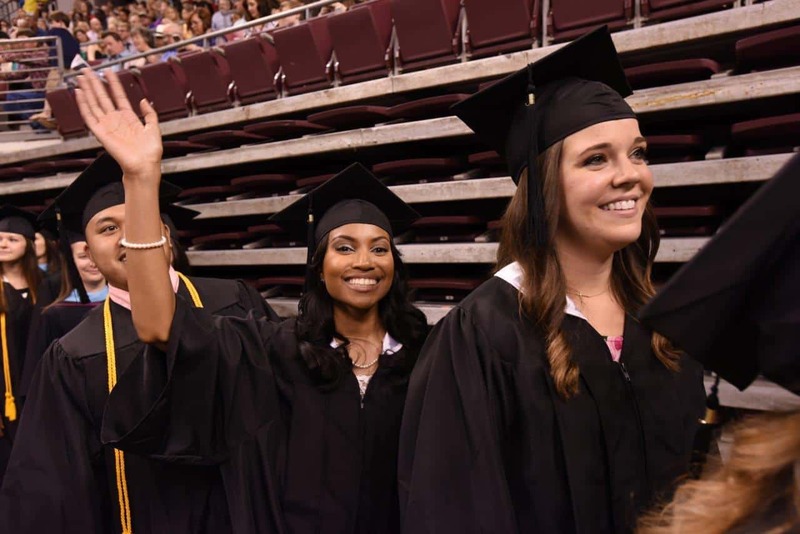 Diplomas were presented to 163 in the College of Medicine; 304 in the College of Nursing; 113 in the College of Pharmacy; 61 in the Fay W. Boozman College of Public Health; 72 in the Graduate School; and 289 in the academic programs that make up the College of Health Professions. UAMS Chancellor Dan Rahn, M.D., presents the Chancellor’s Award to Charles E. Scharlau III, J.D., the retired chairman and CEO of Southwestern Energy Company. During the ceremony, UAMS Chancellor Dan Rahn, M.D., presented the Chancellor’s Award to Charles E. Scharlau III, J.D., the retired chairman and CEO of Southwestern Energy Company, an oil and gas exploration company with midstream natural gas facilities in Arkansas and Texas. Scharlau, a native of Mountain Home, has been the director of several business corporations, including Arvest Bank, Fayetteville; First Arkansas Bankstock Corporation, Little Rock; and C.H. Heist Corporation, Florida. He is of counsel with Conner and Winters, PLLC, in Fayetteville. A graduate of the University of Arkansas, Scharlau served on the Board of Trustees from 1997 to 2007, and as Chairman of the Board for the 2005-06 academic year. He currently serves on the University of Arkansas Foundation Board of Directors as chair of the Audit Committee, and is a member of its Executive Committee. In 2011, he and his late wife endowed the Charles & Clydene Scharlau Chair for Hematological Malignancies Research at UAMS, which supports continued development of new treatments and therapies for blood cancers such as multiple myeloma. In 2015, he created a second endowed chair at UAMS: the Scharlau Family Endowed Chair in Cancer Research in honor of Kent C. Westbrook, M.D., and Bart Barlogie, M.D., Ph.D. Additionally in 2015, Scharlau established the Endowed Chair in Presidential Leadership to support the University of Arkansas System. 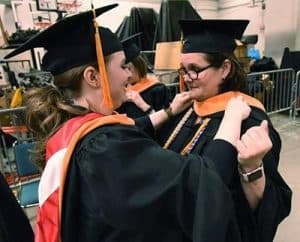 Before the graduation ceremony, students help each other with their ceremonial regalia. During commencement, degrees and certificates conferred include the doctor of philosophy, doctor of medicine, doctor of pharmacy, doctor of nursing practice, master of science, master of nursing science, bachelor of science in nursing, master of public health, doctor of public health, certificate in clinical and translational science, master of health administration, post baccalaureate certificate in public health and a variety of degrees in allied health disciplines including certificates, associate and bachelor of science degrees, post-baccalaureate certificates, master of imaging sciences, master of physician assistant studies and doctor of audiology. Jennifer Ellen Ball — Washington, D.C.